Over the last decade or so, the Islamist group Boko Haram has been responsible for horrific acts of violence, thousands of deaths, and the displacement of one million people in Northern Nigeria and surrounding areas. While Boko Haram would appear to be a part of a wider terrorist phenomenon, linked to Al Qaeda and ISIS, historian Kim Searcy demonstrates that Boko Haram's agenda is local, not international, and the roots of that agenda stretch back several centuries. Read these fascinating Origins articles for more on Africa: Islamist Groups in Egypt; A New World Order? Africa and China; Ethiopia and Nile River Tensions; Politics in Senegal; the Darfur Conflict; Piracy in Somalia; Violence and Politics in Kenya; Women in Zimbabwe; and Sport in South Africa. Two years ago the world was gripped when Boko Haram kidnapped 279 school girls from the Nigerian town of Chibok. Despite the international attention, which goaded the Nigerian government to mount a rescue operation, the whereabouts of most of the girls remain unknown. On May 5, 2014, following the kidnapping, Boko Haram’s leader Abubakar Shekau posted a video on the internet stating explicitly that neither he nor his followers acknowledge the Nigerian government. Shekau’s rhetoric is consistent with Boko Haram’s violent insurgency, which has targeted Christians, Muslims, Nigerian government officials, and English-language schools. The consensus among many academics, journalists, and commentators is that Boko Haram is an Islamist organization founded in 2002 in Borno state in northeastern Nigeria by the now-deceased charismatic cleric Muhammad Yusuf. Some say the rise of Boko Haram is part of the larger global phenomenon of Islamist terror organizations including Al Qaeda and ISIS. In fact, rather than just a recent organization, the roots of Boko Haram lie deep in Borno’s past. The impetus for the group’s current activities can be traced back to three historical processes: the Islamic reform movements of the 19th century that took place in West and Central Africa, the changes wrought by the British colonial presence in northern Nigeria, and in the inter-ethnic conflict and struggle for natural resources that accompanied the creation of the modern state of Nigeria. Maiduguri, the capital of the state of Borno in Nigeria, is Boko Haram’s current base of operations. Borno is now among the poorest states in Nigeria, but in the 13th century Kanem-Borno was one of the most extensive kingdoms in sub-Saharan Africa. During this time, Islamic institutions and practice put down roots in the region. And Boko Haram’s social and religious identity is rooted in developments in the region over the following centuries. This region, known as the Sudanic Belt, encompasses the bio-geographic zone south of the Sahara, stretching from the west Atlantic coast of modern-day Senegal eastward to contemporary Eritrea, but bounded on the south by the forest and savanna regions of the continent. Hummay, Muslim founder of the Sefuwa dynasty and the first mai (king) of Kanem-Borno, conquered the region in 1068 and encouraged the spread of Islamic institutions. The Sefuwa mais controlled large swathes of territory from the eastern shores of Lake Chad in the south to the oases of Fezzan, the southwestern part of modern Libya, in the north. Hummay ruled for nearly 12 years, but the emergence of various more or less autonomous ethnic groups distinct from the Sefuwa ruling dynasty prevented the development of a centralized political system. In addition, Kanem, which consists mostly of desert and semi-desert, lacked the primary resources needed to make such a system viable. A serious crisis finally led to the collapse of the Kanem state in the latter part of the 14th century. The mai Umar b. Idris (1382-87), with a group of his supporters, left for Borno to the west of Lake Chad where necessary resources could be found and where the Sefuwa had already settled their vassals. A large number of immigrants from Kanem had also already settled there. The Sefuwa’s main objective on their arrival in Borno was to build a strong regional economy to support a well-organized, Sefuwa-dominated political structure. 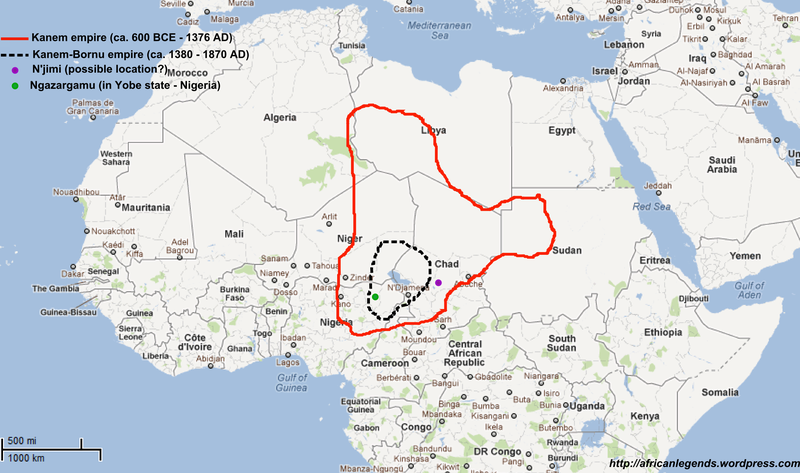 The period from about 1480 to 1520 was a time of active Islamization in the Sudanic belt. During this period many scholars from Mali, North Africa, Egypt, and the Saharan oases visited the region of West and Central Africa known as Hausaland, and contributed to the deepening of Islamic ideas and culture. The Sefuwa mais of Borno had been Muslims since the 11th century and they traditionally surrounded themselves with Islamic scholars (ulama) who gave them an advantage over other rulers. Borno became a great intellectual center visited by scholars from Sudanic Africa and other parts of the Muslim world, and its cultural influence was felt outside its own regional sphere of influence. Most scholars agree that Borno reached its zenith under the rule of Idris b. Ali (1564-c.1603). He was a skilled diplomat and keenly interested in Islamizing the region. In 1571, Idris b. Ali made the pilgrimage to Mecca, and upon his return he initiated many reforms in order to bring his country in line with other Muslim states. He also forged strong diplomatic alliances with the sultans of the Ottoman Empire and the sultans of Morocco, which fostered trade relations between the three states. Borno’s primacy in Islamic education and control of trade led to its ascendancy in Sudanic Africa during this time. The death of Idris b. Ali (c.1603) did not mark the end of Borno as an empire. Rather, it resulted in Ali’s conquests being consolidated under his successors and to the emergence of the Kanuri as a distinct ethnic group. The term Kanuri came into use in the early 17th century, and referred to the dominant ethnic group of Borno. The majority of the Sefuwa mais hailed from this ethnic group. Today the Kanuri continue to be the dominant ethnic group of Borno state in northeastern Nigeria. Though that ethnic group only makes up about eight percent of Nigeria’s total population, most of Boko Haram are Kanuri. The Kanuri are distinguished from their Hausa and Fulani neighbors by their language and by the distinguishing vertical marks on each cheek. Both men and women have these markings. This custom of marking the faces of children was done to identify the family and ethnicity of a person, though the practice is now in decline. Islamic religion is the defining cultural factor that unites the Kanuri people in Borno state. And Kanuri scholars credit their ethnic group for spreading and preserving Islam in the region. Despite widespread Islamization, many areas continued to embrace a syncretic form of religion blending Islam with older animist religions. Islamic scholars railed against this religious syncretism and the Western Sudanic region witnessed a series of Islamic revivalist movements in the 19th century that sought to end this practice. Boko Haram is a direct descendent of these efforts to cleanse Islam of animist and other spiritual beliefs. The primary objective of these Islamic reform movements was to restore Islam to what reformers saw as its original purity. These movements were led by a class of men who were devout, committed, and very learned in the Islamic “sciences”—the Quran, the traditions of the Prophet Muhammad, and Islamic law. The ultimate goal of the reformers was to establish a state modeled upon the nascent Muslim state in 7th-century Medina. The reformers criticized the rulers and the common people alike because both engaged in this syncretic form of Islam. The ulama (scholars) had turned a blind eye to this blending of Islam with animism because they received patronage from the rulers. However, the reformers looked askance at this compromise and preached openly against the rulers who married more than four wives, did not allow women to inherit, and, most egregiously, mixed Islam with animism. The rulers sought to resolve this conflict militarily, but were defeated. The old rulers were overthrown and replaced by devout reformers. The participants in these revolts hailed from diverse social and ethnic backgrounds. But their leaders were mostly from the Fulani ethnic group. The most successful revolt occurred in what is now northern Nigeria and culminated with the formation of the Sokoto Caliphate. By 1812, a Muslim empire emerged with the charismatic Fulani cleric, Uthman Dan Fodio, at its helm. Dan Fodio had defeated the corrupt and, from his perspective, irreligious, Hausa Muslim rulers of various kingdoms in the Western Sudan, and created an empire based upon the Prophetic precedent. Al-Kanami fought several campaigns to protect territory and by the mid-19th century had become the most powerful person in Borno. Muhammad al-Kanami died in 1838, and was succeeded by his sons. The last of these sons to rule Borno, Shehu Hashimi was defeated in a battle with the Sudanese warlord Rabih Zubayr ibn Fadl Allah in November 1893. At the same moment, France and Great Britain were engaged in machinations to gain control of Borno, which was soon caught up in the tumult of competing colonial aspirations. British colonial policies—especially the granting of power to rulers of the former Sokoto Caliphate—had a direct effect on the development of Boko Haram’s ideologies and approaches. When Borno was conquered by Rabih Zubzyr ibn Fadallah in 1893, he made Dikwa (54 miles east-northeast of Maiduri) his capital. In 1900, Rabih was killed by the French who then proceeded to restore the al-Kanami family to power in Dikwa. Then, in 1902, the British conquered Borno and incorporated it into its colonial possession known as the Northern Nigeria Protectorate. In a case of imperial balance-of-power politics, Germany complicated matters by creating the West African colony known as Kamerun which included parts of contemporary eastern Nigeria. As a consequence, the British and Germans divided Borno between themselves. Dikwa became part of the German protectorate (1902-1916), and the British took control of the remnants of the empire of Borno. Dikwa then became part of British Colonial Nigeria in 1923, as one consequence of the First World War. All northern Muslim rulers were required to take an oath of fealty to the British crown. For their part, the British maintained that the rulers would not be required to do anything contravening the laws of Islam. Despite their public pronouncements that they were interested in ruling in an even-handed, neutral manner, the British colonial administrators’ commitment to Indirect Rule required them to support those already in power and to quell any revolts, real or imagined, that might threaten the status quo. Many British had a negative view of Islam. So the colonial administrators identified so-called “good Muslims” and placed them in positions of power and authority over the “bad Muslims.” The “good Muslims,” in the eyes of the British, were the former rulers of the Sokoto Caliphate because British officials considered them to be religiously moderate. Thus, the British and the former rulers of Sokoto had a symbiotic relationship that continued until Nigeria’s independence in 1960 and the creation of the Republic of Nigeria. Independence, however, did little to change the political arrangements established by the British. The descendants of the Sokoto rulers who the British had placed in power continued to have the same relationship with the independent state of Nigeria, existing into the contemporary period. This reality is at the core of Boko Haram’s grievances.